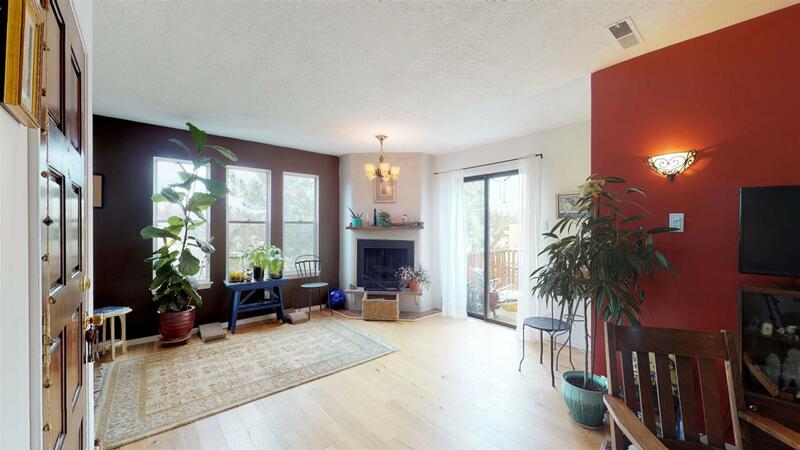 Ideal location in South Capitol neighborhood. A spacious, quiet and bright condominium, this upper floor oasis has two bedrooms, two bathrooms, a wood burning fireplace, underground parking with designated space, and locked individual storage unit. Hardwood floors in main living area and bedrooms, with LVF in bathrooms and kitchen. Kitchen updates include stainless steel Samsung convection electric range and hood, a Blanco sink, marble countertop, and tiled backsplash. A Samsung HE washer, dryer, full home HydroFLOW for hard water, whole home water filtration system for bathing, central heating and air, a cozy deck with surrounding mature trees. A short distance to the Railyard, Farmers Market, Guadalupe Street and Plaza. Convenient close shopping at Natural Grocer, Whole Foods and Trader Joes, and dining at Paper Dosa, Maria, Clafoutis and Mimosa Caf'. Move in ready! Listing provided courtesy of Megan Gonzalez of Realty One Of Santa Fe. © 2019 Santa Fe Association of REALTORS®, Inc. MLS. All Rights Reserved.